Here we are, sitting in a terminal at Kuala Lumpur, awaiting our transfer to the second leg of our flight to London. Arriving at 6am local time, 2 hours earlier than Melbourne time, we found a good little spot to sit with non-reclining chaise longues, which allow us to sit with our legs outstretched. We changed some money so we could buy a coffee with Malaysian Ringgit. 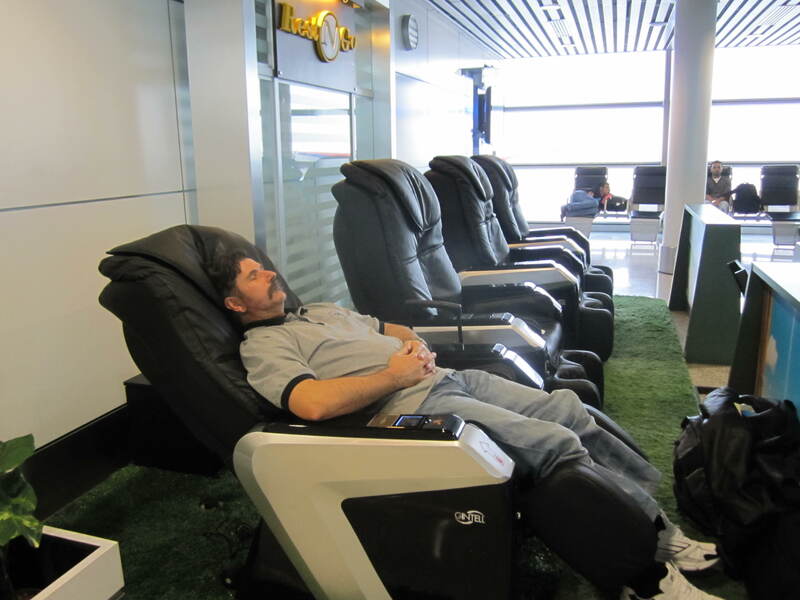 Approx $4 for a cappuccino but we have been utilising the notes for the massage chair. These are like the ones they have at some shopping centres for a ridiculous cost of $10 for 5 or 10 minutes. Here, for one MR you get 3 minutes, so I enjoyed 21 minutes for less than $2.50, which has helped prepare me for the next sector, still over an hour away. Once again, one has to remind oneself that the waiting at terminals is all part of the travel experience, and along the way you can meet interesting people, such as Tresan, a 26 year old returning to Australia after about 3 years overseas. 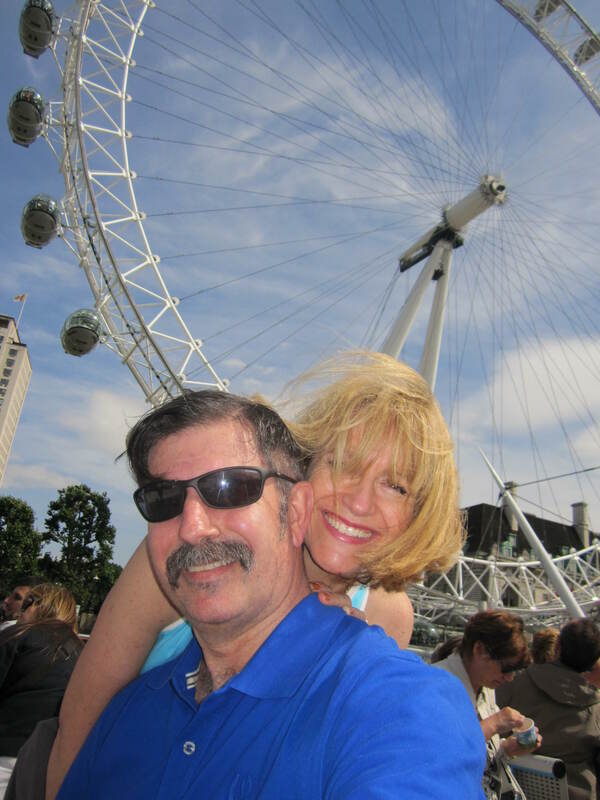 I was telling her how different travel is these days, compared to when I first went and had to wait for ages to hear from anybody – writing a letter that took about ten days to get to Australia, and then if someone deigned to reply immediately, would arrive in England almost three weeks after the first letter had been penned. Now with facebook and emails, you could be at home instead of halfway across the world. We are in such a global society that the world has shrunk. This is the first time I am doing my Trip Book electronically and this Word document is going to form the basis for my first-ever attempt at a blog. I used to think blogging was almost cheating as a way of getting published, but it is the way of the world now. The book “Julie and Julia” prompted me to realise that it is more about allowing people to have an opportunity to read what you have written. Meanwhile, I am working on my own book “A Year of Summers”©, which I started writing way back in 1986, but the time wasn’t right then. I had babies and then they were growing up. First I was concerned about what Mum and Dad might think, and then later I didn’t know what my two daughters would think. Now I think if I don’t do it I never will, so I have suggested to family and friends that anything in the book they don’t like is obviously fiction. Earlier this year when I used our timeshare at Nepean I decided that if I didn’t start writing my 1981 travel memoirs seriously this time I would give it up forever. Hence, as I am a deadline type of girl, it worked. I have temporarily given up reading while I write, and I have now written at least 55,000 words, a good start, and intend to continue during this trip as well. This is the year of creativity and writing! Years ago, in 2003, when my sister and I travelled, I had bought souvenirs in South Africa that were a little fragile. As we were two women on our own, we had to contend with our luggage. The escalators in the London Underground are extremely long and steep, so one of us would go down to the bottom, ready to retrieve the case that had been placed on the stair by the other sister. I was waiting for the suitcase when it teetered over and tumbled down. “My zebra!” I called out, but fortunately there was no damage to it when I later checked. However, the two giraffes kissing, a tribute to the memory of Mum and Dad, who had died in 2001, did not fare so well, as their necks were broken. (The statue, not my parents). Obviously the entwined giraffes were made of talc stone rather than the granite I had thought they were made from. The Underground, therefore, is dangerous for me. This time it was me who came tumbling down, another source of contention for very tired travellers. All I wanted was sympathy, but other people wanted to know how it happened. It was an accident, as if I’d deliberately do that. The tea tree ointment I bought has been helpful for soothing and preventing infection. Remember, it could always be worse. We bought two tickets on the Heathrow Express for £21 each, which took us through to Paddington and then onto the Underground. Today we saw a price on a minicab. Door to door it could have cost about the same, and someone would not have had to contend with those escalators again. I know, at least it wasn’t stairs! Cadbury purple is what I will think of whenever I remember the Premier Inn. It is their signature colour and is on everything. The curtains in the room, the logo, the business cards, etc. Unfortunately when we arrived we had to walk up nine steps to get to reception, nine extremely big steps at the end of a long trip. At least the room is pleasant but comfortable and a reasonable size, but has no fridge or safe. There is neither exhaust fan nor power point in the en suite. After hours of walking a bath would be delightful, but the shower is a good size and water pressure is fair. Although we had been eating all day and night on the plane, I needed a little something for dinner. Dutchy was happy to have a shower and go to bed, so I popped down to the restaurant for some soup. 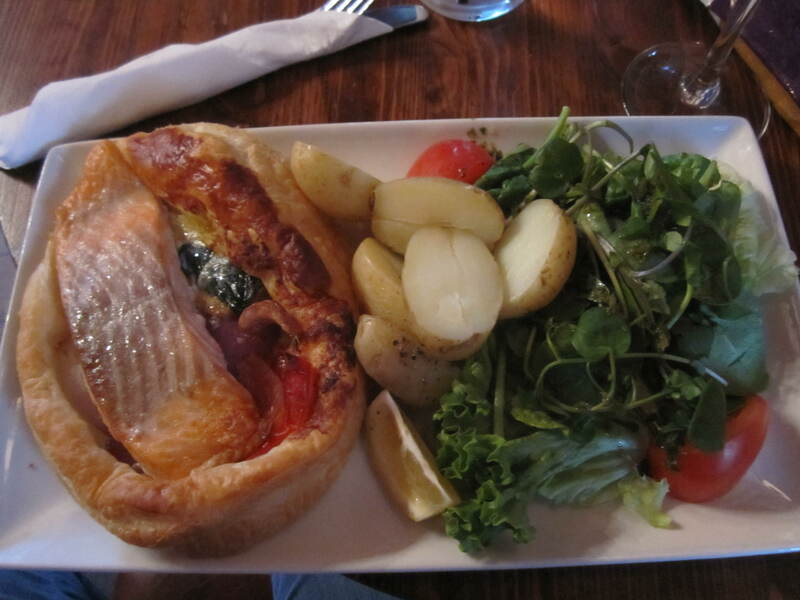 Situated on the lower ground floor, the restaurant was very cosy and modern. The cream of broccoli soup was served in a white double-handled ramekin on a wooden board with a slab of oven-warm tiger bread and butter in a small dish. It was very tasty and just what I needed. I had asked for a glass of water and was very pleased that it came in a long tall glass with ice and a slice of lemon. It’s those little touches that make all the difference. Buffet breakfast time. Sustenance before another day of tourist activities: we usually start with some Granola, real fruit of the forest berries and yoghurt. We are working through the available varieties: blueberry on Tuesday, raspberry yesterday, and strawberry today. The laptop has accompanied us today so we can cruise slowly through a few courses, allowing us to have breakfast through to morning tea before we embark on our next adventure, which will be the second day of The Big Bus Tour. Tuesday we started with a pre-breakfast walk in the cool air. Since we had gone to bed so early of course we woke up early too. Impressed with the standard of breakfast, we then set out to explore the surrounding areas for two hours. Returning to the hotel, I did some Body Balance exercise and Dutchy did some weights, in the form of lifting a couple of glasses of beer at the pub, reviews of which will be found later. We decided to source out the best form of internet access, settling on a little place called Salad Heaven, where we bought lunch and paid £5 for four hours of internet time, which we will use during our stay in London. Our time started while we were eating our salad and chicken breast wrap, but the gentleman at the counter credited some extra time on our tab. That was good PR, as now we’ll be happy to return there and buy more food. Later I realised that wi-fi was free for customers, so next time we can just use what we paid for and have a cuppa in our room first! Due to the riots in England, our planned dinner at the pub was delayed until Wednesday night as police had suggested places close for dinners that night. So we ended up dining at the hotel restaurant, where I had soup (again), this time tomato and basil, while Dutchy enjoyed the ubiquitous fish and chips, which were excellent. 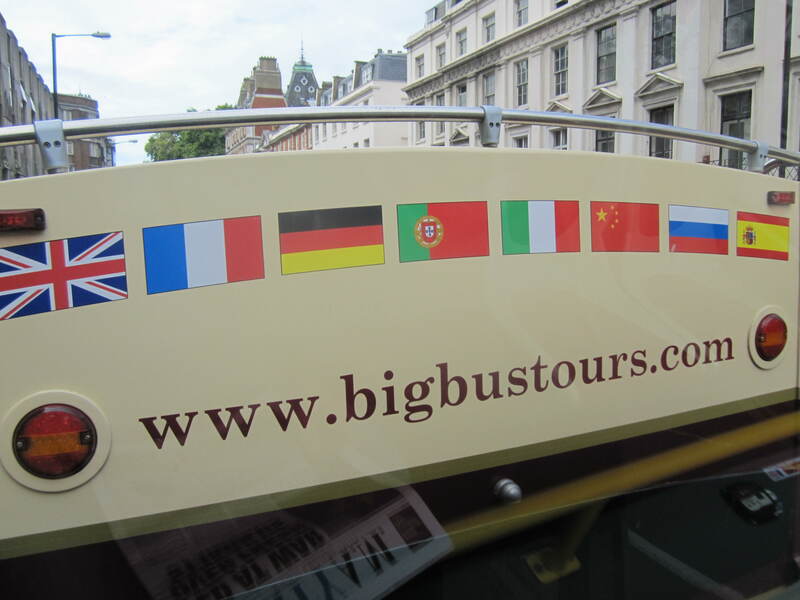 For £32 each, we bought tickets valid for 48 hours on The Big Bus Tour. 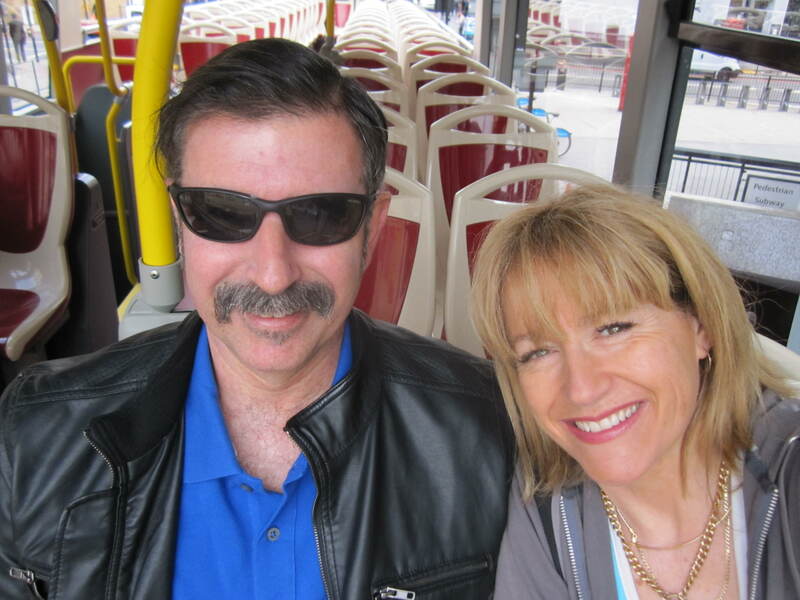 We had planned to get on the bus first thing at 8, but preparing for the day out and eating our buffet breakfast meant we only got to Stop 29 on Buckingham Palace Road for the 9.40 am bus. However, we were first on, so we made our way to the front seats on the top of the double-decker bus, which were under cover, so we were protected from the weather, in this case, some mild sunshine and a little wind. Victoria was our guide, who regaled us with interesting information about the sights we passed during the circuitous route of 2 hours and 10 minutes. 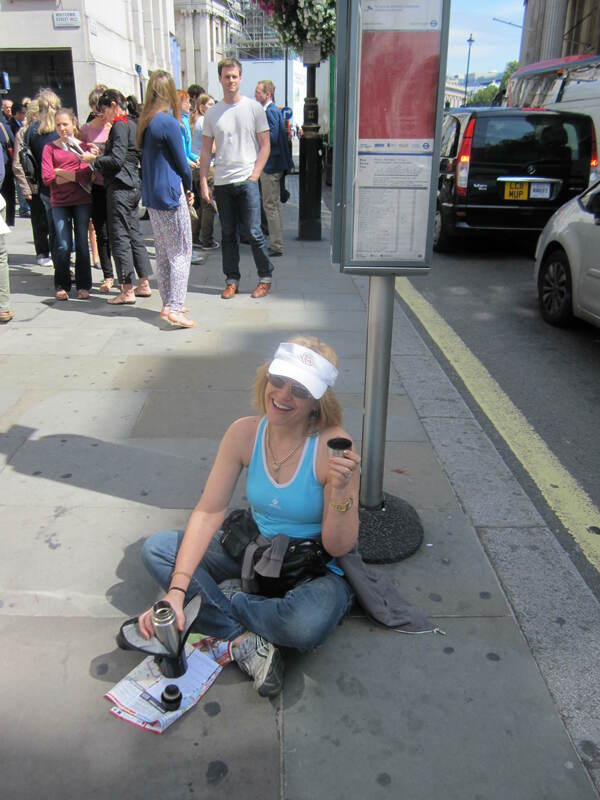 Then we stayed on the bus with the plan to return to Stop 10 for the walk we wanted to do at 1pm. Working out times, we thought it better to alight from the bus near The Ritz and head across Green Park to the meeting point near the National Gallery. By the time we got there I was desperate to find some toilets, and we would have been happy to buy a coffee in order to utilise some. However, at a place called Pret a Manger, they don’t even provide amenities, perhaps because it is by and large a takeaway venue. Finally, the problem was resolved when we located the public toilets at the National Gallery. We were lucky, because when I came out of the Ladies’ loo, a guide or guard let me out through one of those retractable tapes between posts, so I think maybe I shouldn’t have been able to waltz straight in without a purchased ticket? My bladder was extremely grateful. Many people were keen to do this Harry Potter Walk, with our guide Lucy, who took us through various locations from the movies, giving us interesting background information along the way. Having just seen the final movie, and on our way to Harry Potter World in Orlando, this walk was extremely appropriate and quite enjoyable. Some of the locations, such as the Ministry of Magic, are real buildings that have been altered using computer graphics, such as the phone box outside the building. I loved hearing about publishers who rejected J.K.Rowlings’ manuscript. It’s always encouraging for aspiring writers. One of the other stops was Mr Simms Olde Sweet Shoppe, apparently the inspiration for Marmaduke’s in Hogsmeade. Conveniently for us, the walk finished at Stop 22, perfect for boarding the City River Cruise, included in our ticket price, which we took all the way down to Greenwich. We considered this a bonus, as Greenwich may not have been on our list of things to do, or places to see, but now we can add it to the “Been there, done that” list. The market took my fancy, and I found a “bling” jewellery stall, where I purchased my first souvenirs from London: a bling bracelet in black and silver with a metal heart clasp, and some sterling silver semi-quaver earrings, both for under £20. As we had not had lunch yet, we stopped for afternoon tea at a little cafe, but the chocolate cake we shared was a little disappointing, and the froth on the cappuccino insignificant. However, the photos we took sitting there turned out really nicely. We made our way up the hill to the Old Royal Observatory, where we got a photo of us each standing half in the western hemisphere and half in the eastern hemisphere. One day I would like to stand at 0 degrees longitude and latitude. Would that be in the ocean or maybe in Africa? Maybe I should google it? Then we caught the last boat back at 5.25pm; how the day can fly! Rather than going all the way back on the boat to Westminster, we thought we could crib some time by getting off at The Tower of London and taking the bus back to Victoria. However, the time we saved was then wasted when a certain husband of mine led the way the long way round to the pub. Thursday, though we were up early, was a slow start because after the long buffet breakfast I stayed in the restaurant to type while Dutchy returned to the room to watch some news. Thank goodness the riots and unrest are nowhere near us. Consequently we were on our way when everyone else was. Then it was also drizzling, but I hadn’t brought a hat or umbrella; really that was silly going to England. Anyway, I was prompted to buy an umbrella with cute leopard print, which I didn’t need to use because as soon as I bought it the sun came out again. Summer meant big crowds, which we had expected, but congestion can be annoying. We bought our reduced price tickets for Madame Tussaud’s at the Big Bus for £25.50, a saving of £5.50 on the regular buy-at-the-door ticket price, which also enabled us to be in the fast track queue. Fast track, mmm. Our fast track wait was 45 minutes. However, that was at 11am, and the regular entry queue had a wait of four hours apparently. When we came out later it appeared to be a better time to head down there, about 2pm. Another way for easier access is to buy tix online directly from Madame Tussaud’s, which gives you Door 2 access, a proper priority door. Not sure of the price, but it would be nice being a VIP. Bags were looked through by the security guy, even my thermos. Dutchy said it did look as though it could contain a rocket launcher, but when he opened it to check some tea spilt over him. Serves him right! That’s mean; he was only doing his job thoroughly. Now girls and boys, we made a big mistake. Little Miss Vanity here and Mr Fussy did not think ahead. 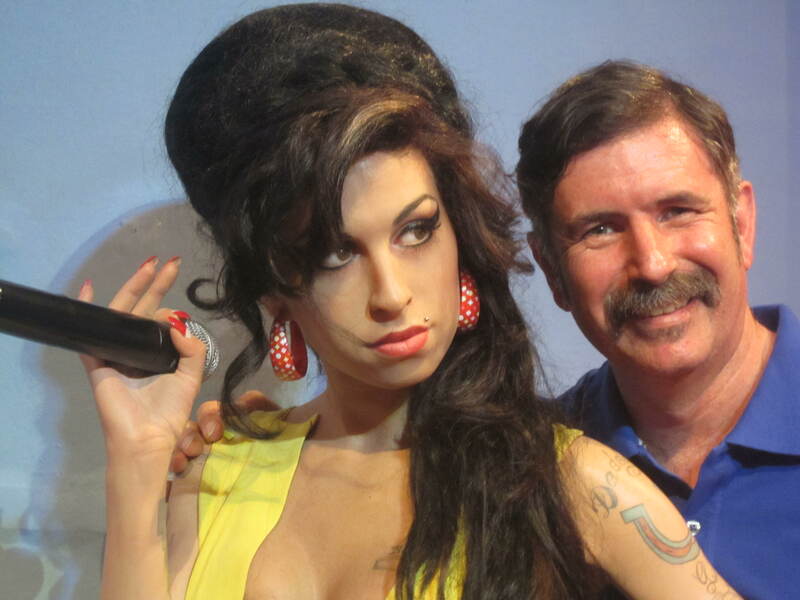 When you go to a place like Mme Tussaud’s, of course you will want to take photos with the wax and fibreglass celebrities, so isn’t it a good idea to dress appropriately and have sublime hair and makeup? Oops! I had thrown on my old red polo shirt, the one I’m planning to throw out/ replace during this trip, and people kept asking me about the queues etc, because the uniforms of the Waxworks’ staff were red polo shirts, emblazoned with the logo. Generally people only see the colour, so I referred the next guy to my “learned colleague”. I could have told him anything! Meanwhile, cast your mind to the restaurant where I am typing this. Someone didn’t know how to use the flatbed conveyer belt toaster and now there is this burnt toast smell emanating from around the corner. I should have done the whole proper makeup routine as well. All I had was some tinted moisturiser and lippy. Fortunately my eyelash extensions saved the day from looking like a total twirp. Dutchy just put that word “twirp” in my mouth. He wasn’t happy with his hair, having washed it and with the extra length it is getting a life of its own. Welcome to my world. He even was talking about more product in his hair. Scary! Most of the celebs are in evening wear so the difference is even more remarkable. It’s amazing how tall most of them are, but Dutchy does point out that they are on a stand. That makes him feel taller anyway, but I couldn’t see Tom Cruise, though apparently he actually was there. He must be short! I moved out of the way of someone taking a photo but then realised she was a model herself, then I thought she was one of those moving statue people/mime artists, as I was sure she moved, but it turned out someone else had just bumped her. I felt decidedly underdressed in my photo with the Princess who shares my birthday, 1st July. 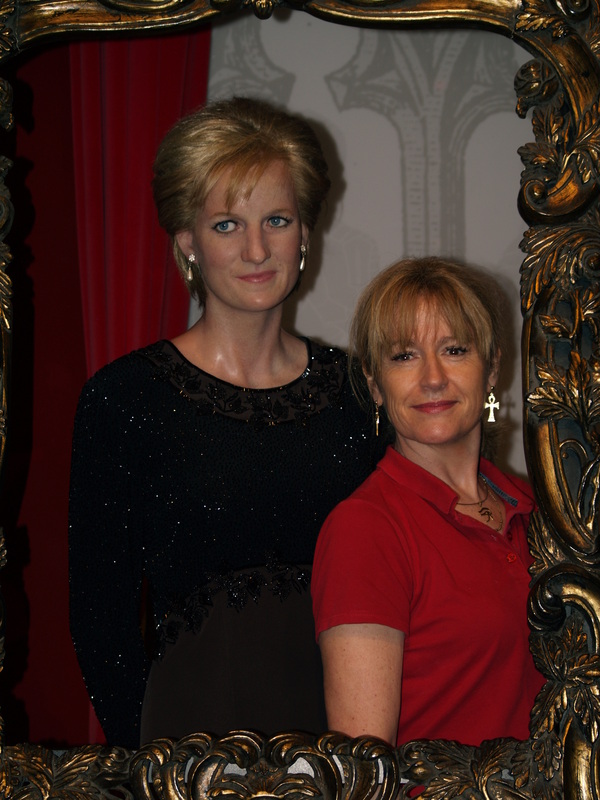 Princess Di was really tall, so I look even shorter than usual. 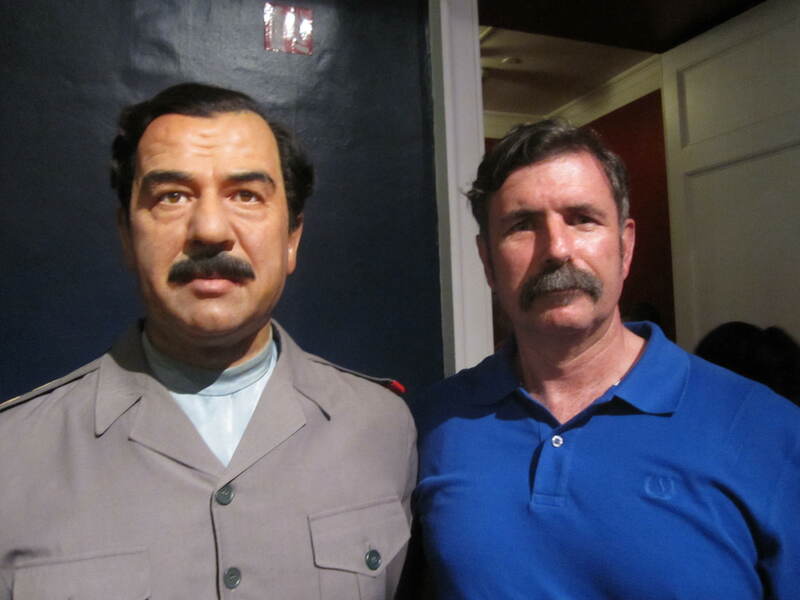 Many of the celebs are so lifelike that you feel you could talk to them. Others, however, don’t quite come up to standard. I was disappointed in the young Elvis, and though Robbie Williams looked quite good, in the photos he didn’t look like himself, so I deleted those ones. Patrick Stewart was amazing, as were many others. My favourite photo is one of me with Audrey Hepburn, sitting down for afternoon tea. Ignore the red polo shirt please. It’s not quite as bad on second viewing. In the first A-list room, if you can overcome the overwhelming crowd, are all the models as if they are at a movie premiere. Value for money is up to the individual. I think it’s a venue that is definitely worth seeing once, as with many tourist attractions. Once again, after a big breakfast and a busy day, we ended up having linner. After Mme T’s we made our way on the Big Bus to Leicester Square to suss out theatre tickets. 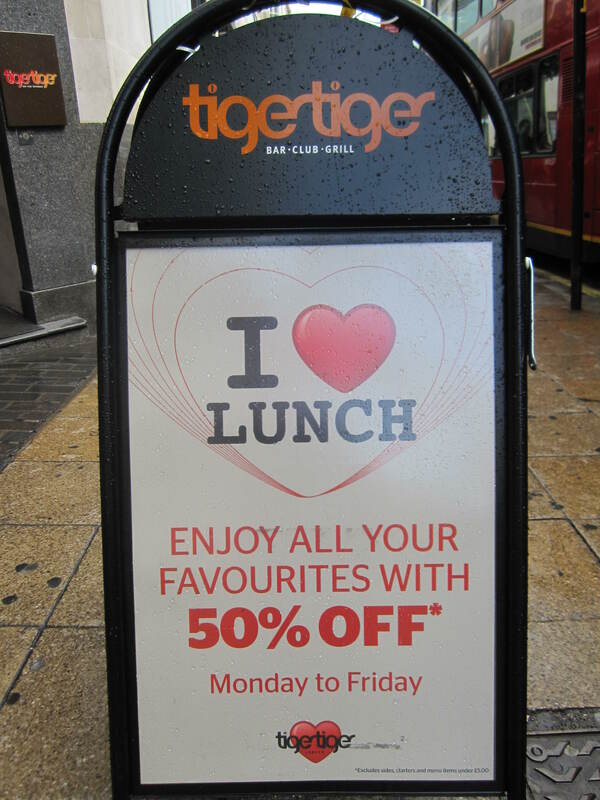 By this time it was almost 3pm, and I spied a restaurant called Tiger Tiger, advertising half-price meals during lunch Monday – Friday. We figured that perhaps this was a place that was busier during the evenings. For under £10 we each had a main, accompanied by a glass of water. I chose the Thai Green Chicken Curry, served with some crackers (like prawn crackers only white) and rice and naan bread in a large square bowl, that left a lovely tingly taste on my lips. Dutchy liked his burger, which was a generous serve, with a small side of chips, plated up on a board. This board business is the current fad for serving up dinners, and is rather attractive. Be careful if you’re buying tix; know your prices, as we were quoted £30 – £35 for tickets that originally were not much more than that. 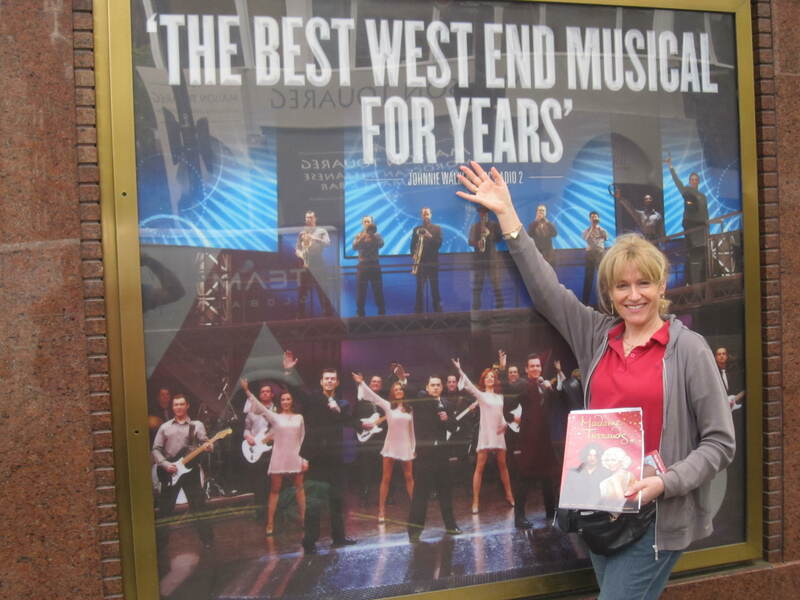 Jersey Boys was our choice, because it was a show that finished in Melbourne before I had got around to seeing it. Found some for the Grand Circle for under £30, so snaffled them up. Our plan was to return to the hotel to freshen up and get ready to go out, and also so that Dutchy didn’t have to lug around the heavy backpack, which contained not only the large digital camera, but the passports and documents, as there is no safe in the room (something to consider when booking hotels), and finally a bottle of Jim Beam to take to France. Stupidly, we had forgotten to get some duty-free on our outward bound journey. Black Beauty Dark Porter – cool very thin version of Guinness. Not necessary to try that one again. While he was drinking that glass, two businessmen walked into the pub and stood at the central table around a pillar, with two tall glasses of beer. Dutchy was interested to know what type of beer they contained, as it looked nice and cold, so I went over and asked. Stella Black (Stella Artois) – cold, refreshing and tasty. This is apparently one of the most popular lagers in London. 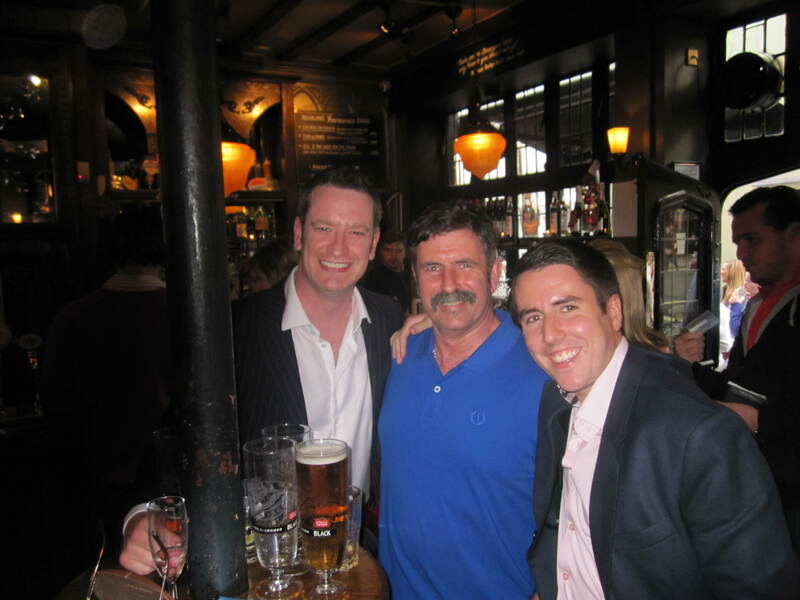 Gareth and Kevin work together in insurance underwriting and broking, and were very pleasant drinking companions. I’ve always believed in a particular saying, and there was the very saying chalked up above the bar: “There are no strangers here only friends you haven’t met yet” – William Butler Yeats 1865 – 1939. Having spent a pleasant couple of hours in the pub, we only had to walk diagonally across the road to the Prince Edward Theatre to thoroughly enjoy the performance of Jersey Boys. I used to buy and collect programs from shows I had seen, but have realised it’s just more hoarding. We did purchase the one from Mme Tussaud’s but felt it unnecessary to buy the Jersey Boys one, particularly because we knew none of the names of the stars, being London-based. We were going to take the Underground back to Victoria, but decided for the cost of tickets for only 2-3 stations, it was such a lovely balmy night we would walk, which took us 45 minutes. Each day we take turns in choosing the slightly long way round to the hotel, and by the end of the week we will know exactly where we should have gone. Maps can be quite useful but it’s more of an adventure to guess where to go. Arriving back here at pumpkin hour, I washed my hair before bed. 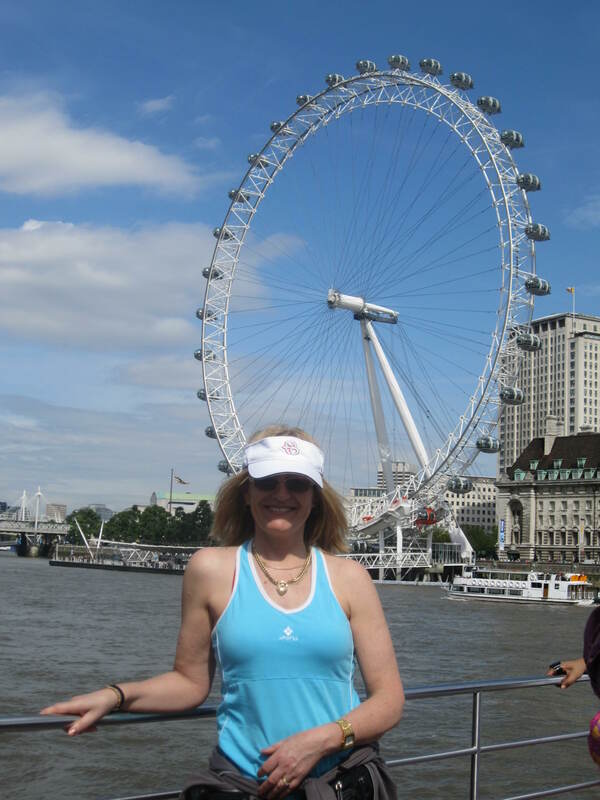 London’s water is not very nice on the hair. I think that means it’s hard water. It leaves a stain on the cup when you have black tea, similar to Adelaide. We really are spoilt with our Melbourne water, despite its slightly chlorinated taste these days. 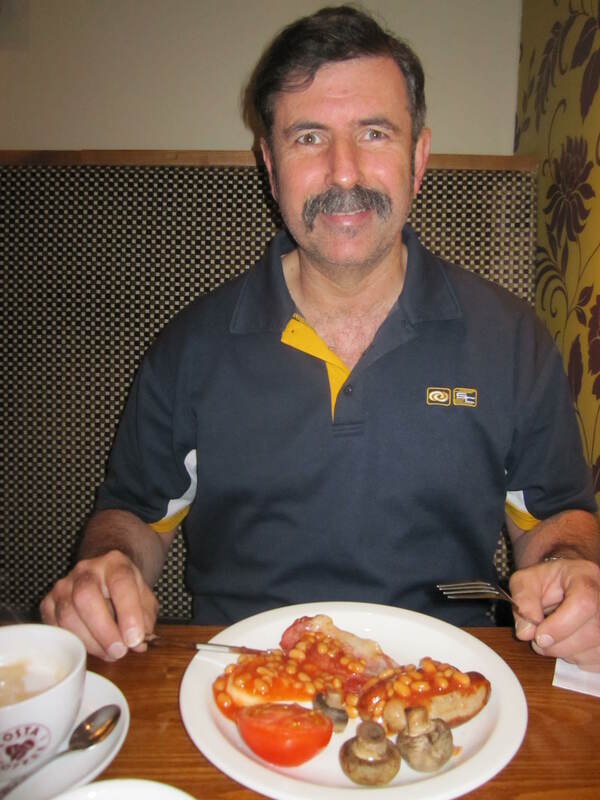 Friday ended up being a quiet day after the busy preceding days, where we relaxed over a lingering breakfast. I straightened my hair and then we went on the internet at Salad Heaven where we uploaded photos onto facebook and caught up with emails. Dutchy went for a long walk while I did Body Balance in the room, which is just big enough. 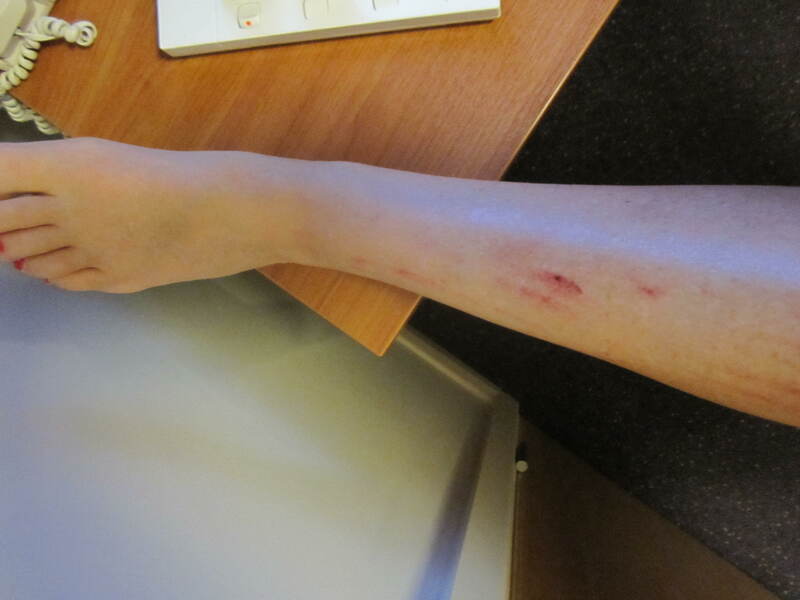 Occasionally my arm or leg would have to dodge around the chair leg or the leg of the desk, but I managed. We did a little shopping at Sainsbury’s, where we bought some lovely Red Leicester cheese and Sainsbury homebrand Harvest Grain crackers, which we enjoyed for afternoon tea. Somehow, with the huge breakfast, we haven’t needed a specific lunch. Rather than going out for a big night, some policemen we met advised to keep a low profile as if something was going to go down it may well be Friday or Saturday night. So we dined at the hotel, where Dutchy enjoyed his steak and I loved the scampi and chips. I asked for some salad instead of the peas or mushy peas on offer. Dessert was lovely, but we forgot to take a photo. Maybe we should have it again? Just for the photo; yeah, sure. Delicious Belgian waffles with chocolate sauce and ice-cream satisfied me, but Dutchy thought his cheesecake won hands down. As in many marital situations, we agree to disagree. Ended up with a TV night in the room where we watched a movie “What Lies Beneath” with Michelle Pfeiffer and Harrison Ford. When travelling I think it is always important to have some “down time” to recharge one’s batteries, which we successfully achieved. This entry was posted in Uncategorized and tagged Big Bus Tour, blogs, escalator, London, massage chair, Premier Inn, St Georges, transit. Bookmark the permalink. hey! it’s a reel book!! some pictures should be welcome. Is this one blog post or 17? Good work tho – are you adding photos later? One step at a time; I think at least starting is good, but I certainly do intend to add photos soon. Enjoyed the first instalment but Dutchy definitely needs to see a barber!! HARRY POTTER WALK! Oh, I’m so jealous! I’ve heard about platform 9 3/4 at Kings Cross, complete with the trolley, good to see some photographic evidence of it. Say, if you like hearing all that behind the scenes stuff about HP, have you heard tell of Pottermore? pottermore.com, have a quick squiz! It’s closed at the moment, but special ones such as myself got early access and there are some nice little unknown things JK Rowling is releasing via this site. Maybe have a look when it opens in a few months. Look forward to reading the rest! Pottermore sounds interesting – will research. Thanks for commenting. How exciting… you have a Featured Blog!